Preparation Methods & Dosage :For constipation, follow package directions, starting with the smallest dosage for your body weight and age. It takes up to 12 hours to work. Not for extended periods. Externally castor oil can be applied directly to the skin, and is commonly used in conjunction with heat packs for lower back pain. 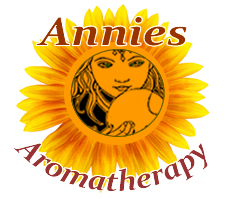 Ayurvedic Medicine Castor oil is pungent and sweet with a heating energy and is applied in oil packs and massage oils for pain relief. 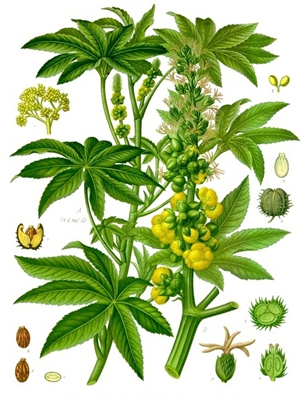 Castor Side Effects: Seeds and leaves are poisonous, the treated oil is not. Etymology: From the Latinricinus - mottled seeds resembled ticks. Ornamental annual. Cultivars have large, bronze or maroon leaves that provide dramatic backdrops to gardens. 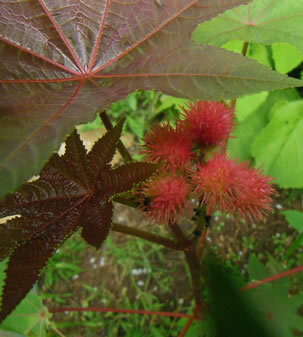 Castor (Ricinus communis) bean oil is very glossy, thus used in lip salves, and highly occlusive for wetness protection. Castor oil plus zinc is a common diaper rash ointment.